Art Deco platinum engagement ring with humongous starlite of 10+ crt: Description by Adin Antique Jewelry. Zircon is an underrated but magnificent gemstone that has been worn and treasured since ancient times. Don't be confused by the name. Zircon is not the synthetic material known as cubic zirconia. It's a completely distinct, natural species. Transparent reddish brown zircon is called Hyacinth or Jacinth, light yellow to colorless zircon is called Jargoon or Jargon, green zircon is called Beccarite, yellow zircon is called Melichrysos, colorless is called Sparklite and blue zircon is called named Starlite and Stremlite. Coincidentally, zircon is the original diamond simulant. When properly cut, colorless stones can make beautiful and convincing diamond substitutes and even outshine mediocre diamonds. Its high dispersion is close to that of diamond. Zircons are stunning gemstones in their own right. They are found in a wide range of colors, and many additional colors can be produced by heat treatments. Almost all colorless and blue zircons have been heat treated. This treatment is undetectable and stable. The popular blue, colorless, and golden yellow shades can only be produced by heating. The stones that yield these lovely colors are usually reddish-brown. This treatment is less common with other colors. Precious stones: One starlite with an estimated weight of ± 10.25ct. 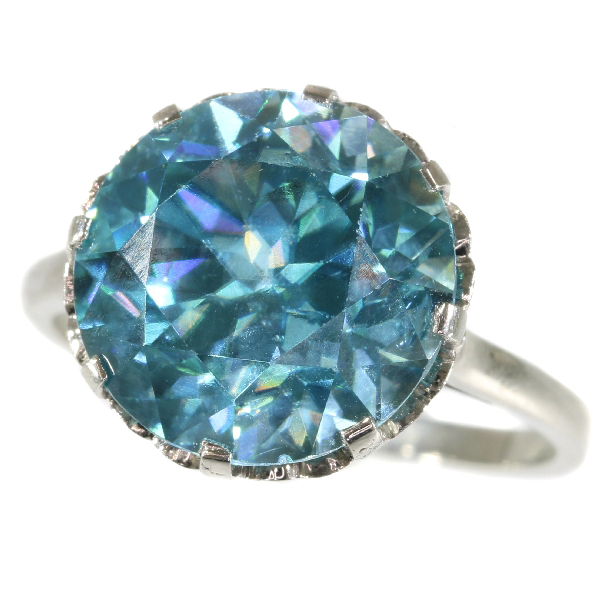 Treatment: Almost all colorless and blue zircons have been heat treated. This treatment is undetectable and stable. The popular blue, colorless, and golden yellow shades can only be produced by heating. Birthstones: Zircon is the birthstone (or month stone) for December.